The Braidwoods website provides a selection of property in Dumfries and Galloway and Callisti is pleased to be able to help with their website hosting requirements. This is one of a growing number of Drupal content-managed websites on the books. 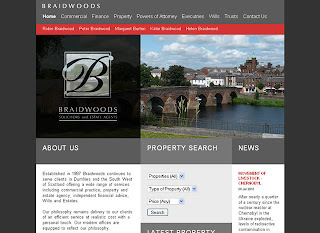 The website is updated by Braidwoods staff with properties for sale for which they act as estate agents. The property details display the schedule as a web page but also include a print-friendly option.